There is something sacred about a barn, maybe just about this barn...maybe just for those of us who have not had to load hay or cut hay year after year. Most of the hay we use is delivered, and this load came from a field less than a mile from us. 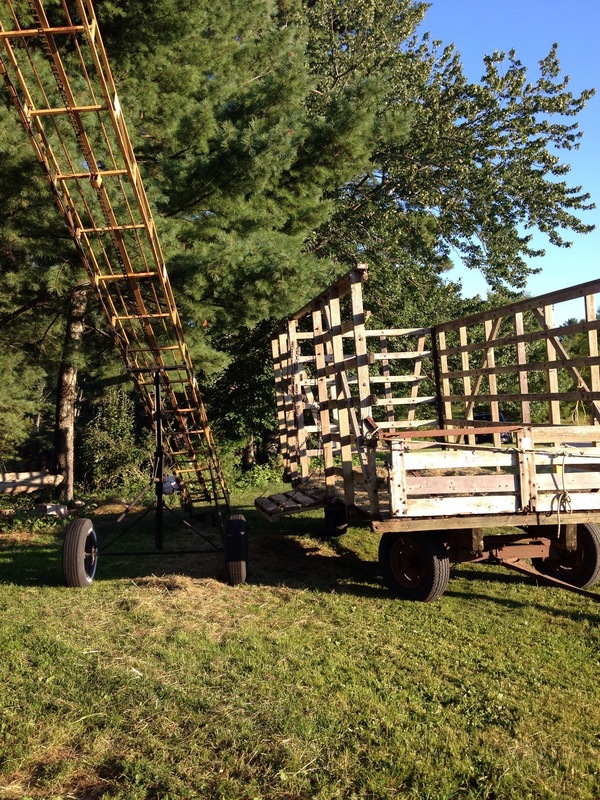 Farmer Larry cut and baled it, loaded it in a wagon and delivered it, with this conveyor. We unloaded the hay and he picked up the wagon and conveyor later. A small percentage of the hay is cut by hand with a scythe from the fields behind our home. Cutting (mowing) hay by hand is a great deal of work, and very meditative--again, perhaps only for those of us who have not had to do it our whole lives. The grass is cut for about 10 minutes, then the blade on the scythe is dressed with a wet stone. The blade of the scythe is peened before cutting using a peening tool and hammer. If done properly the scythe has a very sharp edge to it that will last for several hours with the periodic dressings. I have scythed for hours in the morning sun drinking iced coffee and water, listening to a book on tape, running from bees when they felt it was necessary to ward me away from the hives. 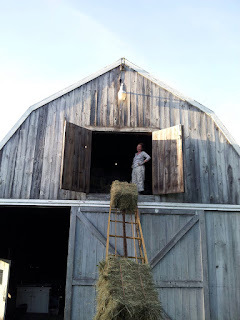 I have thought about the time it takes to mow by hand, rake the hay, then drag it into the barn on a tarp, hauling it up to the hayloft and putting it in loose. It almost feels like cheating to buy it by the bale at $4 a bale delivered. I wondered about the economics of using the tractor to cut, rake, and bale acres and acres, and how many people must have been out in the fields for days to accomplish the same task by hand. I wonder about the hay, and the energy required to feed a goat or a cow, the milk it produces, or the meat that is available after their slaughter and if this is really a wise use of the vegetation. Could we be eating the goldenrod directly. At the end of the day, the goats and chickens are always excited to see a new pile of hat at the barn door before getting hauled into the loft. The chickens are eager to find bugs in the hay and the goats are like like wine testers, nibbling here and there to sample and find the most tender aromatic grass. There is never any doubt which hay our goats prefer--it is the hand scythed hay cut from the fields around the barnyard, raked and stored loose in the loft. It is always a wonderful treat in early February when it is bitter cold in the barn, to treat the goats to an arm load of the hand cut hay, to smell the spring that is only a few months away.